CARLTON is knocking on the door of the top eight after cruising to its sixth victory of 2016 with a 38-point win over a lacklustre Brisbane Lions outfit at Etihad Stadium on Saturday. The Blues set up their win in the first half, when they kicked eight goals to the Lions' one to go into the main break with a commanding 39-point lead. The Lions briefly threatened to get back into the match in the third term. With Carlton ruckman Matthew Kreuzer failing to reappear from the rooms after becoming ill at half-time, the Lions took control in the midfield and kicked four of the first five goals after the main break to cut the Blues' lead to 21 points. However, the Blues killed the contest by kicking the next five goals of the game and then cruised to a 16.6 (102) to 9.10 (64) victory. Kreuzer was later suspected to have been suffering from concussion symptoms at half-time, the club revealed. The win leaves the Blues at 6-5 after 11 games, making it the first time since 2013 they have enjoyed a winning record. First-year defender Jacob Weitering was impassable in defence for the Blues, cutting off Lions attacks time and time again with his sure overhead marking. Last year's No.1 draft pick finished with 14 marks (three contested) and had five rebound 50s. Ed Curnow (28 possessions and one goal) was prolific in the midfield for the Blues and held Daniel Rich to just four touches in the first half before switching on to Lions skipper Tom Rockliff after the main break. 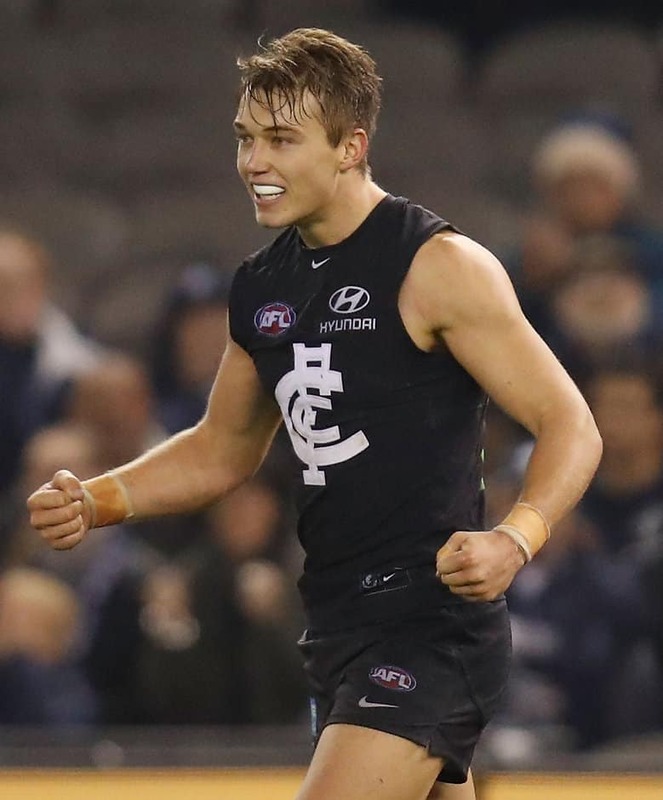 Patrick Cripps (26 disposals, six clearances and two goals) did his usual heavy lifting around the stoppages, Zach Tuohy and Sam Docherty gave the Blues plenty of drive from defence, and Dennis Armfield and Jed Lamb finished with three goals apiece. The win takes the Blues to ninth on the ladder and, at least temporarily, only percentage behind eighth-placed Adelaide – the Crows will go a game clear if they defeat St Kilda at the Adelaide Oval on Sunday, while Port Adelaide will also leapfrog the Blues if it defeats Collingwood at the MCG that same day. Carlton coach Brendon Bolton said the Blues' win was pleasing coming off the back of a six-day break and with Kreuzer sitting out the second half. "It's probably fair to say we were a little inconsistent at times. We turned balls over that we'd like to use better," Bolton said. "We've been building with our ball movement and we just got 100 points today, so that's a good sign." On a day when Melbourne's bleak weather created a foggy haze under Etihad's closed roof, the Lions' dismal 2016 continued. The Lions have recorded just one win this season – in round four against Gold Coast – and never seriously looked like adding a second victory on Saturday. Their day was further soured by a second-quarter shoulder injury to Allen Christensen. The midfielder did not reappear from the rooms after copping a fair bump from Andrew Walker late in the second quarter and headed to hospital for scans before the final siren. Although the Lions won the clearances 42-25 and had their fair share of the ball, apart from a bright opening to the third quarterand a few junk-time goals they struggled to score. Their first goal did not come until the 16-minute mark of the second quarter, when first-gamer Jarrad Jansen snapped a clever goal, and their 1.4 return at half-time was their lowest of the season. Lions coach Justin Leppitsch was pleased with his players' contested football but said skill errors had largely cost them the game. "We kicked ourselves out of it – I think I might have said that a few times this year – particularly in the early part of the game," Leppitsch said. "Contested footy, clearance stuff was terrific and you could almost say (we) dominated that part of the game, but that's not everything. "We just ourselves down with some skill errors which they capitalised on." Skipper Tom Rockliff led the way for the Lions in his first game back since suffering a hamstring injury in round seven. Rockliff finished with a career-high 48 possessions and a last-quarter goal but, for all his effort, his influence did not match his numbers. Former Blue Mitch Robinson performed an outstanding run-with job on Bryce Gibbs, holding the Blues star to 12 possessions while winning 25 touches himself. Dayne Zorko also battled manfully for the Lions, while Daniel Merrett held Levi Casboult to one goal. The Lions' horror day was summed up by a passage of play late in the second quarter. Former Blue Tom Bell took a courageous mark inside the Lions' forward 50 running back with the ball and, instead of taking a set shot from 35m, elected to play on. Bell only took a couple of steps before he stumbled and fumbled the ball, which fell to teammate Christensen, who was immediately pounced on by a pair of Carlton defenders and pinged for holding the ball. Carlton: Matthew Kreuzer was "physically ill" at half-time, according to the Blues' official Twitter account and did not appear from Carlton's rooms after half-time. The club later suspected he was suffering from concussion symptoms. Brisbane Lions: Allen Christensen suffered a broken collarbone after copping a heavy but fair bump from Andrew Walker late in the second quarter. Lions coach Justin Leppitsch said after the match Christensen was expected to be sidelined for about a month. Carlton has an eight-day break before it takes on St Kilda at Etihad Stadium next Sunday. The Blues have had the better of the Saints recently, winning their past four contests. The Lions play Fremantle back home at the Gabba next Saturday, when they will seek to break an eight-game losing streak against the Dockers. The Lions' most recent win against Freo came in round 16, 2009, at Domain Stadium.